These are copies of very old stereoscopic photographs, dating from 1857. 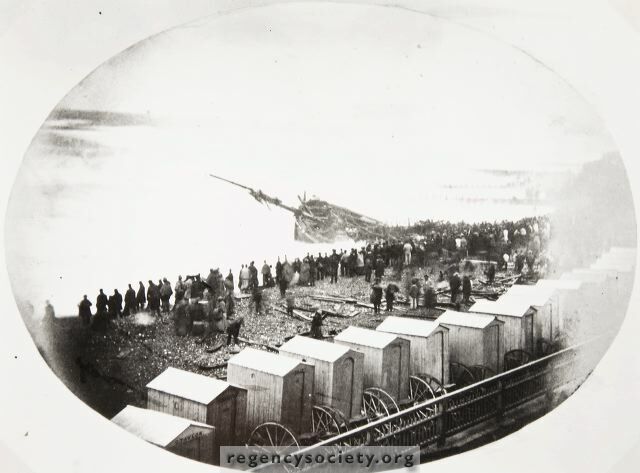 Taken from Marine Parade, they show the coal-brig PILGRIM, from Middlesborough, of 160 tons, wrecked on the beach, close to the Royal Albion Hotel. This took place on Thursday 8 October, 1857. The vessel was owned by Smith and Comper, of Gosport, and was manned by Captain Smithson and a crew of eight. When she struck the brig was level with the outer piles of the Chain Pier. In the lower foreground can be seen part of the Chain Pier Esplanade.